At East End Welding, we saw an opportunity to greatly expand our in-house machining operations as a way to secure greater control of project elements and completion times. Our new, state-of-the-art machining operation is capable of handling some of the largest milling projects, as a quick look at our machining equipment list confirms. 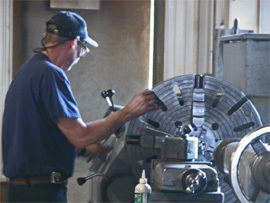 Manual machining operations and old-school, skilled operators also remain an important part of our machining capability mix at EEW. creative work-approach skill-sets that will never go out of fashion.